Much work on reversible hydrogen sorption of carbon nanostructures was stimulated by findings published in an article from A.C. Dillon et al. . 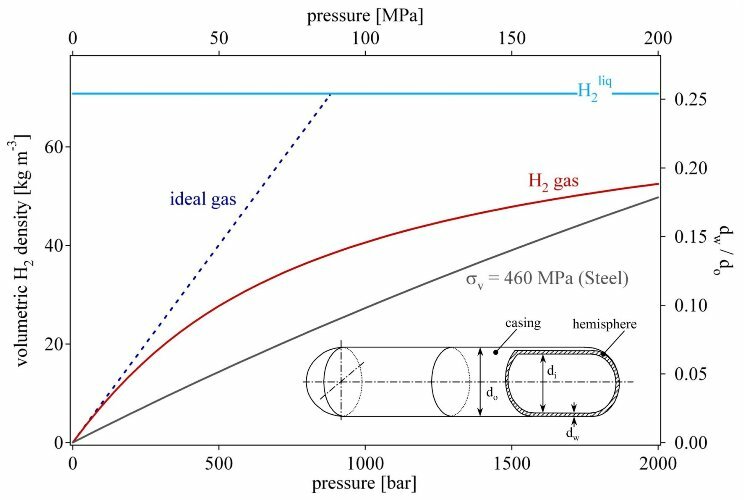 This paper describes the results of a brief hydrogen desorption experiment. 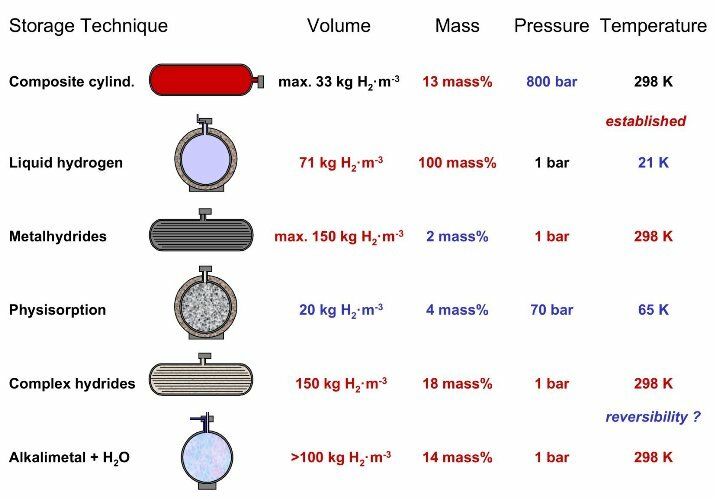 The authors estimated the hydrogen storage capacity of carbon nanotubes at that time to be 5 to 10 mass%. The investigation was carried out on a carbon sample containing an estimated (TEM micrographs) amount of 0.1 to 0.2 mass% of single wall carbon nanotubes. 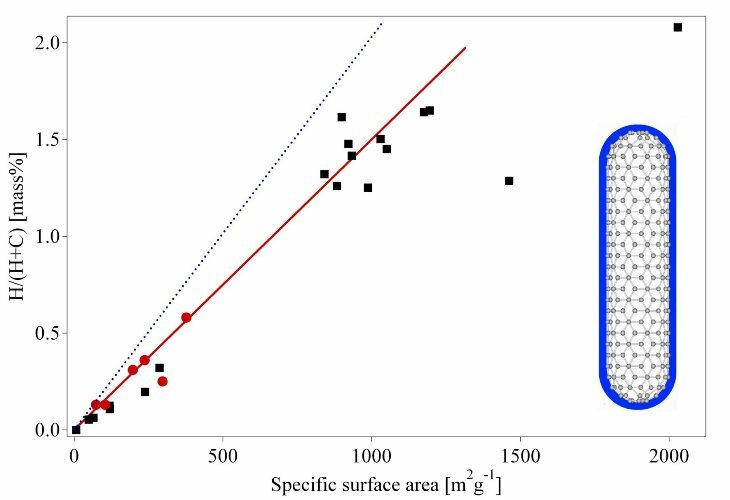 The amount of hydrogen desorbed in the high-temperature peak, which is roughly 5 to 10 times smaller than the low temperature physisorption peak, was 0.01 mass%. 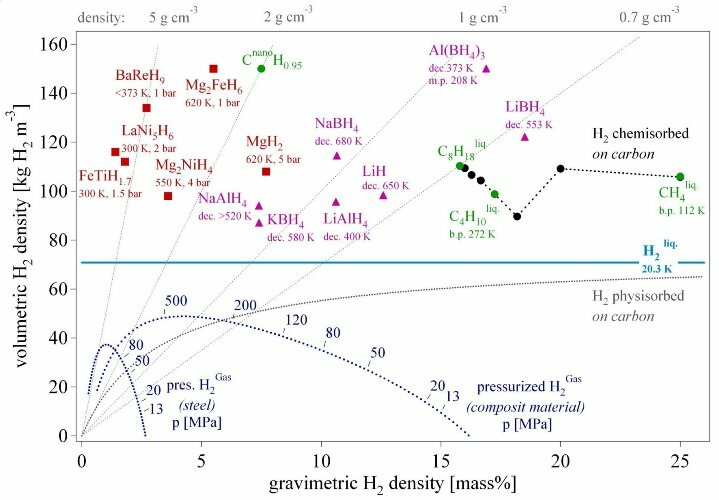 The authors concluded „Thus the gravimetric storage density per SWNT ranges from 5 to 10 mass%“. Three years later in a report to the DOE  this peak has moved significantly by 300 K up to 600 K. Apparently the reported results are inconsistent. Hirscher et al. 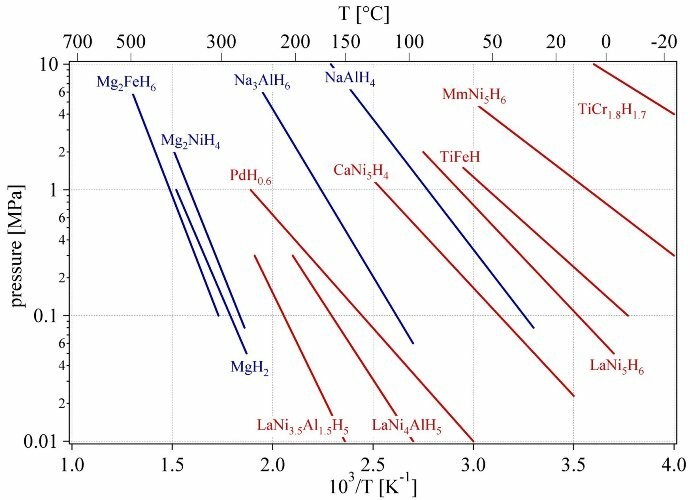 clarified the situation and showed that desorption of the hydrogen originates from Ti-alloy particles in the sample, introduced during the ultrasonic treatment, rather than from the carbon nanotubes. 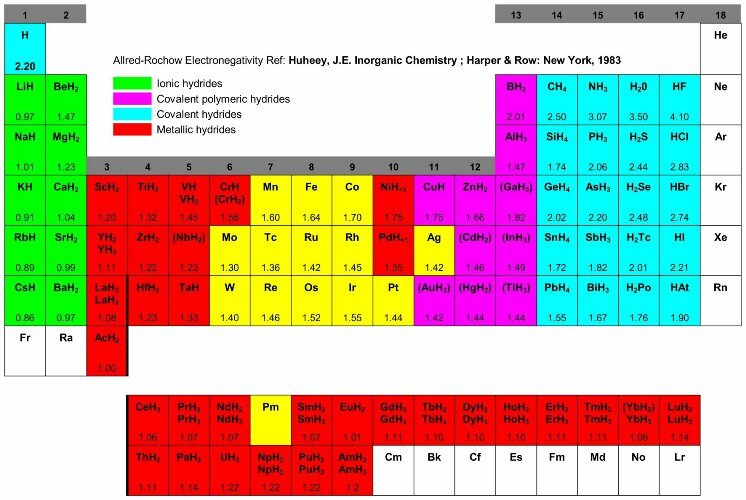 Only a small number of the transition metals are without known stable hydrides. A considerable „hydride gap“ exists in the periodic table, beginning at group 6 (Cr) up to group 11 (Cu), in which the only hydrides are palladium hydride (PdH0.7), the very unstable nickel hydride (NiH<1), and the poorly defined hydrides of chromium (CrH, CrH2) and copper (CuH). In palladium hydride, the hydrogen has high mobility and probably a very low charge density. In the finely divided state, platinum and ruthenium are able to adsorb considerable quantities of hydrogen, which thereby becomes activated. These two elements, together with palladium and nickel, are extremely good hydrogenation catalysts, although they do not form hydrides . Especially interesting are the metallic hydrides of intermetallic compounds, in the simplest case the ternary system ABxHn, because the variation of the elements allows to tailor the properties of the hydrides (Tab. 3). 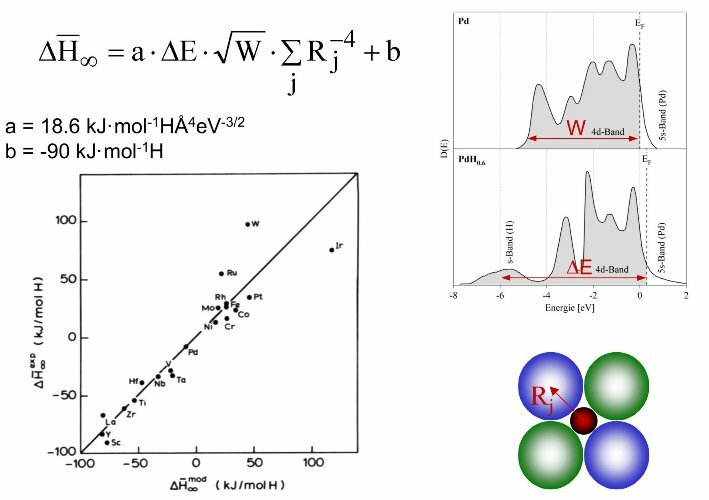 The stability of metal tetrahydroborides has been discussed in relation to their percentage ionic character, and those compounds with less ionic character than diborane are expected to be highly unstable . Steric effects have also been suggested to be important in some compounds [64, 65]. The special feature exhibited by the covalent metal hydroborides is that the hydroboride group is bonded to the metal atom by bridging hydrogen atoms similar to the bonding in diborane, which may be regarded as the simplest of the so called „electron-deficient“ molecules. Such molecules possess fewer electrons than those apparently required to fill all the bonding orbital’s, based on the criterion that a normal bonding orbital involving two atoms contains two electrons. The molecular orbital bonding scheme for diborane has been discussed extensively . 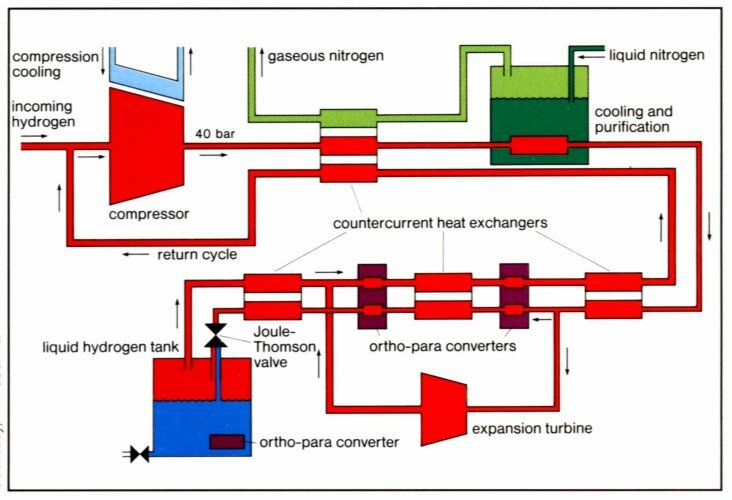 Steinfeld A., Palumbo R., „Solar Thermochemical Process Technology“, Encyclopedia of Physical Science and Technology, R. A. Meyers Ed., Academic Press 15 (2001), pp. 237-256, ISBN 0-12-227410-5. 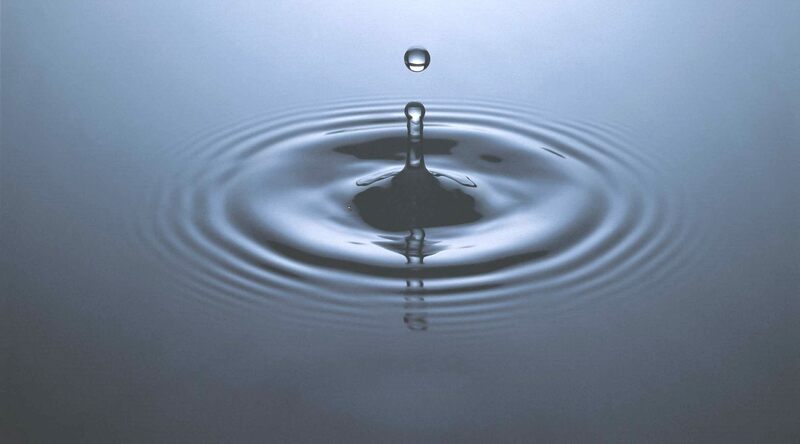 Flynn, T.M., „A Liquification of Gases.“ McGraw-Hill Encyclopedia of Science &Technology. 7th edition. Vol. 10. New York: McGraw-Hill; (1992).pp. 106-109. 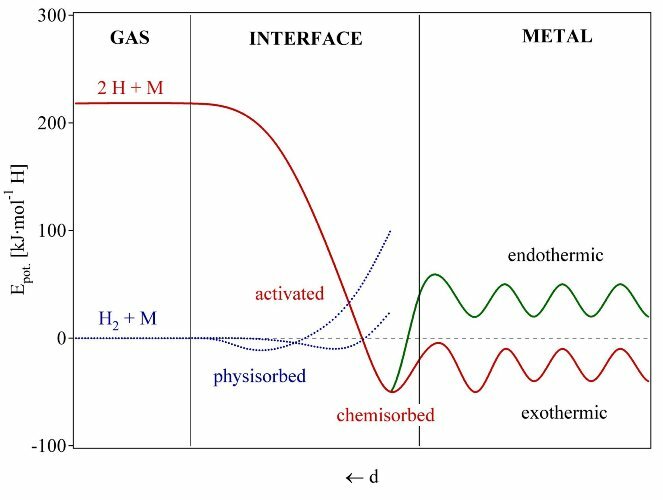 L. Schlapbach, „chap 2 : „Surface Properties and Activation““, Hydrogen in Intermetallics Compounds II, L. Schlapbach (ed), Springer, Topics in Applied Physics, Vol. 67 (1992), pp. 15-95. 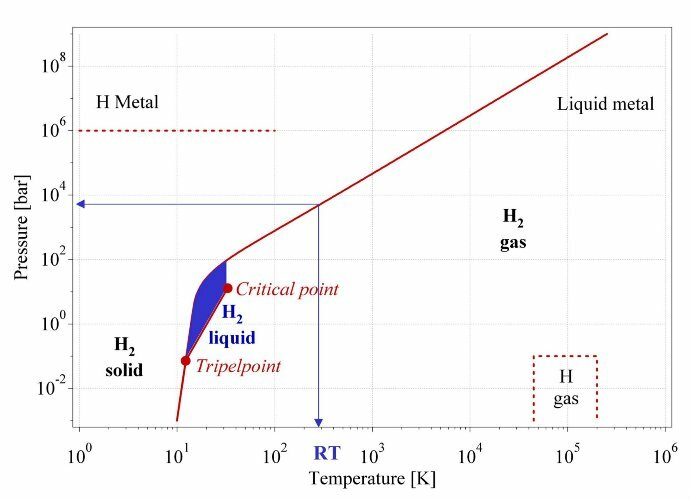 R. Griessen and T. Riesterer, „Heat of Formation Models“ in „Hydrogen in Intermetallic Compounds I Electronic, Thermodynamic, and Crystallographic Properties, Preparation“, L. Schlapbach, ed., Springer Series Topics in Applied Physics, Vol. 63 (1988), pp. 219-284.